The AbbVie funding will support the construction of a new Family Commons on the Memphis campus, the first facility of its kind at St. Jude, designed to be an entirely treatment-free floor that will offer spaces for families to relax, recover and connect in a centralized location. Additionally, with the AbbVie gift, St. Jude can further transform its physical spaces with families in mind, adding a walking path, gardens and playground accessible for children going through treatment and their siblings. "At St. Jude Children's Research Hospital, we work to ensure patients and their families have the very best experience possible," said James R. Downing, M.D., St. Jude president and CEO. "As we asked families how we could further enhance the environment, many of them told us they would appreciate a space away from the medical setting—a place that offers them family time, creative outlets, resources and opportunities to socialize with other families. The Family Commons area will do just that." 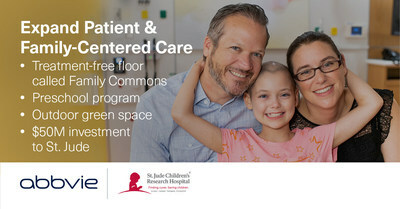 The Family Commons floor, currently under construction and planned to open in 2020, is the result of months of research on the best way to deliver care, including interviews with St. Jude patients and families that will inform the creation of this industry-leading physical environment that supports healing and recovery. A Parent Share Area for families to get non-clinical answers from other St. Jude parents. St. Jude parent Cindy Howard serves on the hospital's Family Advisory Council, a group that informed the Family Commons concept. Her son Chandler was diagnosed with medulloblastoma, the most common type of pediatric malignant primary brain tumor. Chandler has completed treatment and returns to St. Jude for periodic checkups. "It's so important to have thoughtfully designed space for patients and parents alike to deal with all of the day-to-day challenges that living with cancer brings," Howard said. "Treating and defeating a child's cancer diagnosis requires an investment of time unlike any other. I'm so thankful to St. Jude and AbbVie for their commitment in creating an even better homelike environment at St. Jude where kids can be kids and families can be families." Knowing that St. Jude patient families spend extensive time at the hospital for medical appointments, procedures and treatments, AbbVie's donation will help transform the St. Jude campus with more outdoor green space where families can relax, socialize, recover and play. The donation will fund a playground designed so that children experiencing treatment or with mobility restrictions can enjoy the space. The donation will also fund gardens, landscaped walking paths and a 3.5 acre green space referred to as "The Quad," adding 282,000 square feet – nearly five football fields – of usable greenspace to the St. Jude campus. "Families need to be able to take a break during one of the most difficult times of their lives, and that's why we're committing to create spaces—both indoor and outdoor—for families to be together," said Laura Schumacher, executive vice president, external affairs, general counsel and corporate secretary at AbbVie. "As a company committed to helping families thrive, we stand behind St Jude, a global leader in the fight against childhood cancer." The AbbVie gift will cover construction of the Family Commons and outdoor space, as well as five years of operational costs for both. This donation from AbbVie is part of its commitment to make an additional $350 million in charitable contributions in 2018 to U.S. nonprofit organizations that align with the company's philanthropic focus areas. As part of these donations, AbbVie is contributing $155 million total to three leading nonprofit organizations working to address the challenges faced by families of children diagnosed with a life-altering illness. "Our sincerest thanks to everyone on the AbbVie team for sharing their passion and commitment through this significant donation, the largest in our history," said Richard Shadyac Jr., president and CEO of ALSAC, the fundraising and awareness organization for St. Jude Children's Research Hospital. "AbbVie is a great example of what it means to be a true 'socially responsible organization' choosing to use its resources, time, and talent to better communities and improve health care outcomes across the globe. We thank AbbVie for its generous donation to our mission and applaud its leadership to impact a range of critically important issues clearly demonstrating how a company can do well by doing good."